LanguageCorps is a Massachusetts based company that specializes in creating personalized adventures in teaching English abroad. To put it simply, we help you become certified to Teach English as a Foreign Language, and then assist you in finding a good, paying job in your country of choice. We know that there are a whole lot of choices when it comes to teaching English abroad. An overwhelming amount, in fact. And while many of our competitors offer excellent products as well, we believe that LanguageCorps provides a better value and service than anyone in the field. So, I thought that for this blog, I would take the time to elaborate on some credentials that might not be obvious to the casual consumer, or on a first glance at the LanguageCorps website. I’m not saying that LanguageCorps programs are for everyone, but these are a few reasons why anyone interested in teaching English abroad should feel safe picking up the phone and giving us a call. And we’ve learned a lot along the way. LanguageCorps is still a family-owned company, but over the past years, we’ve become one of the leading providers of TEFL certification and job placement services in the industry. We have contacts and resources at our disposal that meet or exceed that of our competitors, but we still maintain the level of personalized customer service that one would expect from a small business. Plenty of businesses stay open for nine years without providing a good product or service. But we have maintained an A+ rating from the Better Business Bureau since joining in 2006, and our company has continued to grow year after year. We like to think that’s a testament to the caliber of the services we provide. Everybody has a blog/facebook/twitter now, and people talk. Good press spreads quickly, but bad press spreads like wildfire. Since founding LanguageCorps in 2003, we have made a consistent effort to give back to the communities where we operate. For example, in 2009, we began providing free TESOL training and certification for staff of Cambodia Children’s Fund, a non-profit organization that provides housing, nutrition and medical services to impoverished children in Phnom Penh, Cambodia. We have similar partnerships with several other organizations as well, such as A New Day Cambodia and Airline Ambassadors, and we are continuously searching for new opportunities to expand our community outreach programs. Of course, nobody’s perfect, and we’re no exception. While we take great pride in the fact that the vast majority of LanguageCorps alumni are satisfied customers, there is the occasional bump in the road. But for those few who find reason to complain, we will do everything in our power to find a satisfactory solution in a timely manner, and to make sure it doesn’t happen again. I truly believe that LanguageCorps provides an excellent service at a good value. But I don’t expect you to believe me. So check out some of these links, and give us a shout sometime. 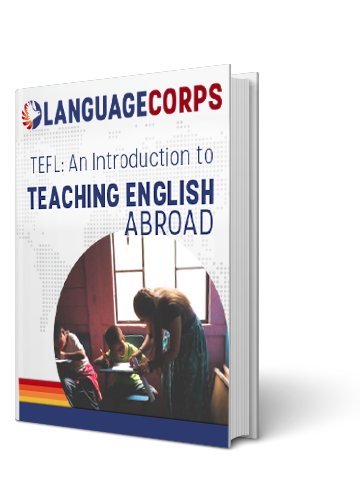 We love hearing from you, so if you are interested in Teaching English Abroad, or even just a little bit curious, drop us a line anytime at info@languagecorps.com. We are always happy to answer any questions you might have, and look forward to talking with you about your future ideas and plans!